One of the key things that drives everything that we do at CodeRGV is the long-term effect it will have on the community. When we put together programs to teach robotics, we’re not just teaching kids something cool, we’re getting them ready to be a productive part of the workforce of South Texas that is known for the manufacturing that happens in the region. Teaching block-based programming and other technology skills isn’t as much about the skill itself as it is about critical thinking, thought process, and how to logically create things. We know that we serve a much larger purpose when we help the community out as a whole and we encourage everyone that attends our classes or functions to take that knowledge back out to the community to make our entire area prosper. When a disaster occurs, sometimes people want to help, but they don’t know how. We get stuck with that a lot. As a group of technologists whose primary focus has been supporting people in enterprise environments, public education, government IT, and all things inside offices, it’s hard to find a place for people with a skill set like ours to be able to help. After all, in order for all of our stuff to work, electricity and communications are essential. When we built our classroom on wheels one of the first things that we decided to do with it was to make it available for emergency aid and first responders in the face of a natural disaster or a critical emergency. It is normal for cities, municipalities, counties and federal agencies, to have an emergency command vehicle. These are big buses there roll-up on-site whenever there’s a disaster. They are used as the central command for communication and relief efforts. However there are fewer of these the smaller the community gets. Small towns and cities in rural Texas for example, don’t have the resources that the larger ones do. They are the ones that get hit the hardest, but get talked about the least. If we can help them by making our vehicle available, then they have a resource that is somewhat outfitted to assist and that can benefit the community at the same time. This week, our C.O.W. (Classroom On Wheels) is going to take a trip North to help people in need of communication support in the wake of hurricane Harvey along the Coastal Bend. Leave your phone at home for one day. Leave your laptop turned off, your iPad in your bag, and disconnect completely from social media. What will people think? What will your family think? If no one can get a hold of you in 2017, something must be wrong. In this case, everyone knows that something is wrong, a storm came through, and this is just adding to the anxiety of the situation. 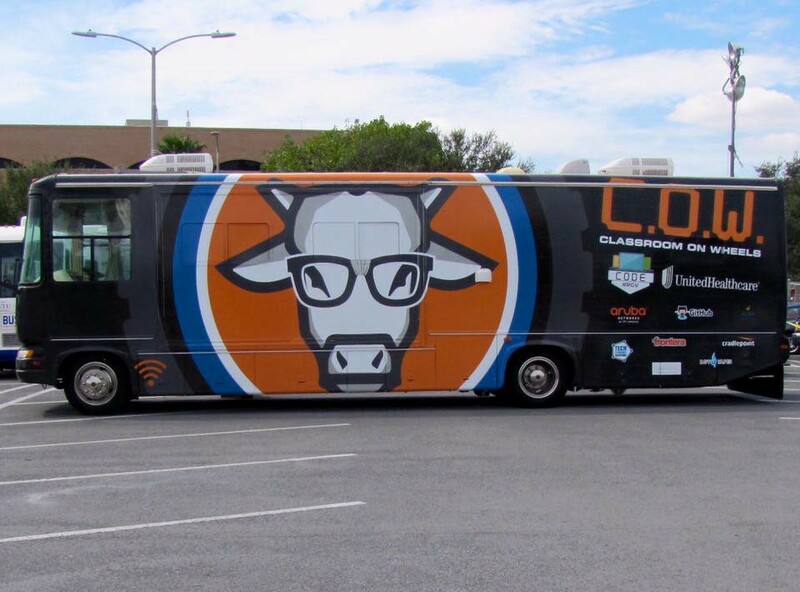 Our COW is outfitted with 20 laptops, regular electrical and USB charge ports, a satellite phone, a couple of ways that we can connect to the Internet, and the equipment that will allow us to light up about one city block with high-speed free Wi-Fi. How Are We Providing Access? Our friends at Cambium Networks put out a call for help right after the storm hit. Our local rep in Texas, Kelly Hatcher, and dear friend Ron Ryan, reached out to us to see if there was anything we can do. After coordinating with a few groups heading into the area, they committed to donating a 450Mbps link if we could find somewhere to tap into the internet. After losing some of their towers to the strong winds, GTEK Communications out of Corpus Christi identified a tower that was as close to us as they could get: about 14 miles. Even though they are in the middle of rebuilding their service provider, they found the resources to help. 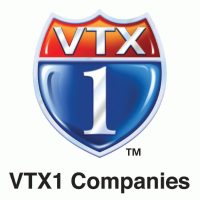 With a radio and a tower location to feed from in place, Rio Grande Valley service provider VTX Broadband committed an 80' Cellsite-On-Wheels to the project. This gives us the ability to pop-up a tower wherever we need to, up to 80 feet in the air! With a way to get 450Mbps to a disaster affected area, all we have to do is plug in our Cambium e500 outdoor APs to provide service and act as a root for a wireless network to span the City block. We can quickly and effectively set up temporary communications just about anywhere in a city. From parking lots to churches, town squares, or anywhere that people congregate to get those in need of getting their lives back together the access they need so that they can let everyone know that they are OK.
Something as simple as a Facebook post, a tweet, or a FaceTime call, can make a huge difference in peoples lives. We aim to provide that in the way that we know how. By helping nerds in need. Our workstations can be used to register for and submit FEMA applications, Texas Unemployment benefits caused by the storm, insurance claims, safety registrations, and many other types of documents and services that a computer is required to submit. When people are scrambling to save the lives of their families during an evacuation, there are a lot of things that are more important than the family computer. We hope that by providing a 20 Seat classroom on wheels, we can give people a sense of normalcy and allow them to do what they need to do so they can start to rebuild their lives. 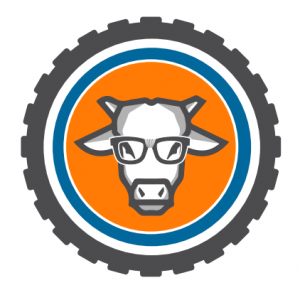 A special thank you to GCR Tires & Service who stepped up and donated 6 Dayton tires to our COW to help us make the trip possible!